Jyväskylä is a city and municipality in Finland and in the western part of the Finnish Lakeland. Kick off your visit on the 11th (Thu): view the masterpieces at Kuokkalan kartano, learn about all things military at Finnish Air Force Museum, and then examine the collection at The Alvar Aalto Museum. Here are some ideas for day two: examine the collection at The Craft Museum of Finland, get a new perspective on nature at Natural History Museum of Central Finland, then take in the spiritual surroundings of Petajavesi Old Church, and finally take in the architecture and atmosphere at Old Church of Keuruu. To see other places to visit, maps, where to stay, and more tourist information, read our Jyvaskyla trip planner . Helsinki to Jyvaskyla is an approximately 3-hour car ride. You can also take a train; or fly. Plan for little chillier nights when traveling from Helsinki in April since evenings lows in Jyvaskyla dip to -3°C. Finish your sightseeing early on the 12th (Fri) to allow enough time to drive to Oulu. Oulu is a city and municipality of inhabitants in the region of Northern Ostrobothnia, Finland. On the 13th (Sat), don't miss a visit to Kauppahalli, tour the pleasant surroundings at Nallikari Beach, stroll through Ainolan Puisto, then steep yourself in history at Oulu Cathedral, and finally pause for some photo ops at Toripolliisi. Discover how to plan a Oulu trip in just a few steps with Inspirock's itinerary builder. Getting from Jyvaskyla to Oulu by car takes about 4.5 hours. Other options: fly; or take a train. 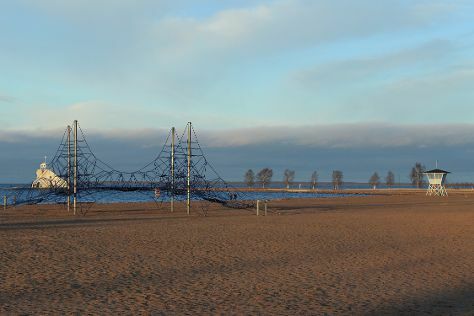 In April in Oulu, expect temperatures between 5°C during the day and -3°C at night. Finish your sightseeing early on the 13th (Sat) so you can travel back home.